There were two Mozarts. Two child prodigies. The famous Amadeus (Wolfie) and his older, overshadowed sister Maria Anna (Nannerl). Maria Anna started playing the harpsichord at eight and by age twelve was an accomplished and acclaimed pianist throughout Europe with a seven year old Wolfgang tagging along – vying for attention and then exploding onto the musical scene with his genius genes that were shared by his set aside and soon to be forgotten sister. Until now. Sylvia Milo a Renaissance woman herself has written a fascinating, surreal and theatrical one woman homage to Maria Anna – THE OTHER MOZART. 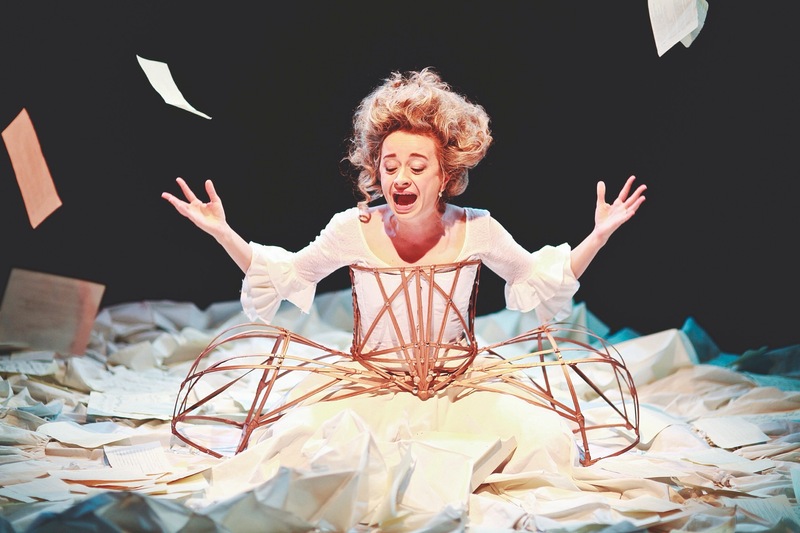 She is performing this seventy five minute “true and untold” story at the HERE Arts Center 145 Sixth Avenue – based on family letters that are strewn across and concealed inside the period eighteen foot diameter dress that fills the stage. Itself a work of art by Magdalena Dabrowska and Miodrag Guberinic covered with sheet music and conceling miniature props that cleverly enhance the story. A metal framework complete with panniers enable Miss Milo to fit herself into the dress when called for – a metaphor for her being imprisoned for being a woman with an enormous talent and not allowed to use it – as women were only supposed to sew and cook and find a husband. They were not to think, not to perform and not allowed to express their innate talents as Maria Anna’s mother keeps harping on. Miss Milo is quite mesmerising. With expressive arms and hands that match her expressive and impressive ability to convey her brother, father and mother – among others – with vocal dexterity. She is also quite the vixen with a sharp sense of humor. Almost dancelike she narrates the tale appearing sometimes to be a marionette – the invisible strings being manipulated by her father – not allowing her to blossom while his son (and her younger brother) becomes more and more famous leaving her to languish at home, bored and frustrated. Sylvia Milo is breathtakingly beguiling as Maria Anna. Original music by Nathan Davis and Phyllis Chen partner with the sublime sounds of Wolfgang. Great lighting design by Joshua Rose and a wonderful do atop the head of Miss Milo by Courtney Bednarowski are perfect adornments. Directed by Isaac Byrne – a wonderful collaboration with his creative team is the result that begs to be seen. Maria Anna Mozart was resigned to her fate as a woman. She was strong willed. Talented. But alas she was a woman. Just imagine if she had been born a man. Would she then have eclipsed Amadeus and not been a mere footnote to his illustrious career? Through July 12th. NOTE: At the performance I attended the show started twenty minutes late – without any explanation or apology. I was not amused. However, Sylvia Milo and the production itself more than made up for any inconvenience. Also please note that the understudy Julia Rosa Stockl will appear at certain performances.